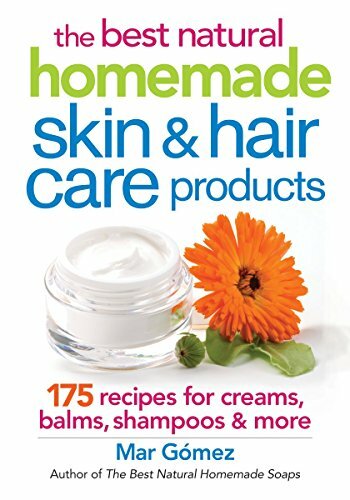 First, let me say, “The Best Natural Homemade Skin & Hair Care Products” by Mar Gomez is a beautiful book. Even if you don’t want to make your own beauty products right now, you’ll be intrigued after leafing through the colorful pages of this book. It is loaded with 175 recipes for every imaginable product and is organized by the type of oil used. Twenty-two oils in fact, and I had only heard of eight of them! I loved looking through page by page of this book, learning about the different kinds of oils and were they came from, as well as their therapeutic properties. The history of the Baobab tree was fascinating and I loved the added historical elements, such as Cleopatra using black cumin oil. If you want to make any of the recipes, you will probably need to do some online shopping (resource list included) unless you have a healthy, natural market nearby. Lanette wax is a required ingredient for most concoctions and some type of essential oil (or two) is usually recommended. I chose to go easy on supplies and try the recipes I could find ingredients for in my local grocery store. Even grapeseed oil was not cheap to come by, but the face/body scrub I made from it and cornmeal was loads less expensive than a fancy concoction I could buy at the beauty counter in a department store. I can even use the oil to remove makeup! Reading through “The Best Natural Homemade Skin & Hair Care Products” by Mar Gomez, I couldn’t help but wonder who figured out centuries ago what these magical oils could do when combined with the right ingredients? For example, when did someone discover that massaging sesame oil onto cold feet would keep them warm the rest of the day? Or, that it could help with a flaky scalp? It’s time to get mixing!